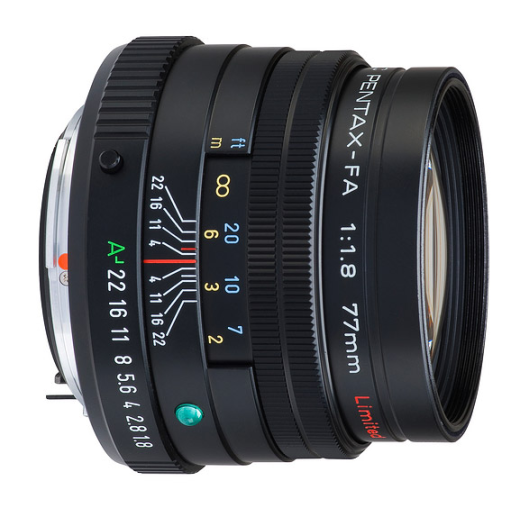 The PENTAX smc FA 77mm F1.8 Limited is a versatile, high-resolution short telephoto lens of exceptional optical quality. It is specifically designed for portrait photography and accurately reproduces the tones, colors and texture of the subject's skin, clothes and accessories as well as assuring an excellent rendering of highlight and out of focus areas. It also features PENTAX's exclusive FREE (Fixed Rear Element Extension) focusing system to ensure sharp, crisp image reproduction over the entire focusing range.